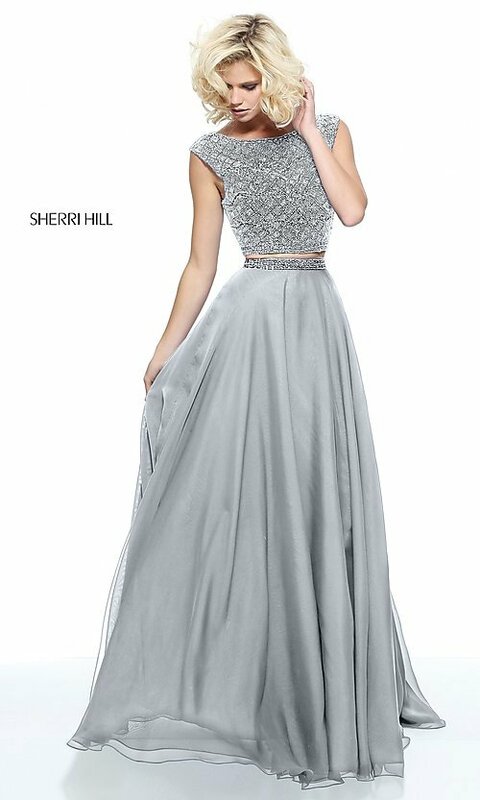 Slip into this long two-piece beaded-top Sherri Hill prom dress that blends classic elegance with the latest fashion trends. Ideal for prom 2019, military ball, or black-tie formal, this long two-piece designer dress is perfect to showcase your love for trendy, yet sophisticated style. 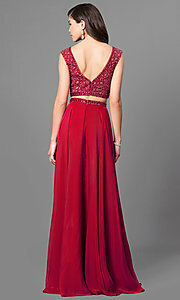 The open-v-back feature on the beaded crop top adds allure to the long prom dress by Sherri Hill. The bateau-neck crop top, adorned with shimmering beads and rhinestones, illuminates any special event. Sparkling accents are also featured at the natural waistline forming a band that crowns the floor-length a-line-style chiffon skirt. Painting a picture of trendsetting splendor has never been easier than donning this two-piece beaded-top long designer prom dress by Sherri Hill. The model wearing periwinkle is 5'9" and wearing 6" heels.